An nRF52832 based, low power wire / contactless badge with Bluetooth Low Energy 5.0 and NFC functionality. In this project I will present the build of the Scan Me! badge, a low power wire / contactless badge, with Bluetooth Low Energy 5.0 and NFC functionality. The badge is based on the Nordic nRF52832, a low power RF SoC featuring BLE 5.0 connectivity, NFC tag emulation and a powerful Arm Cortex-M4 processor. The project also serves educational purposes. Building such a badge, I think it is a great way to learn more about things like BLE, NFC or low power design. To do the electrical and PCB design, I used the KiCad EDA Open Source Electronics Design Automation Suite. 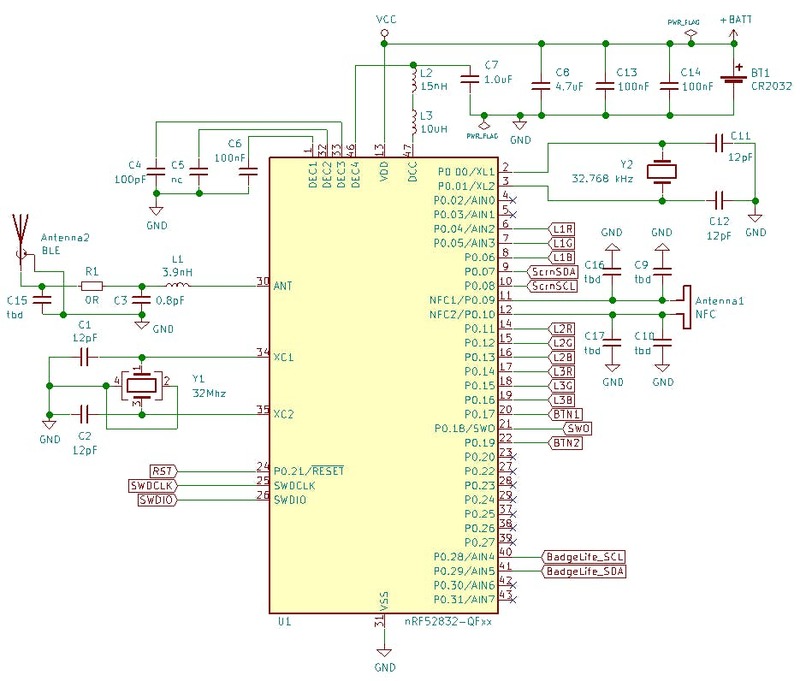 The base schematics is is based on the 53.3 Schematic QFAA QFN48 with DC/DC regulator and NFC setup reference from the Nordic nRF52832's datasheet. For the full list of the components, see the BOM file in the attachments. To be able to use these drawing in KiCad, I used the svg2mod script from mtl to export SVG file to a KiCad PCB footprint module file (.mod). To get an usable result, first Objects and Strokes must be converted to Paths. Also, the drawing must be structured with layers associated with KiCad PCB layers: Cu, SilkS, etc. (more on this in the svg2mod's readme). The first step was to import the Inkscape drawings exported as KiCad module. After this, I just placed components, starting with the biggest components (battery holder, SoC) and then the smallest ones close to pin they need to connect. I took into consideration multiple options (OSH Park, JLCPCB, PCBWay) to manufacture the PCB. Finally, I choose JLCPCB because it also offers components (LCSC) and the fast shipping (DHL) at a good price. It took around 10 days (3 days manufacturing + 7 shipping) to get the PCBs and the components. I also ordered most of the components (all except the OLED Screen and some SMD resistors and capacitors) from LCSC. The total cost for the PCB ($15) and components ($15.84) was $30.84, including DHL shipping. The soldering of the components it's not super easy, but I think it was doable. The trick part was to solder the nRF52832 (QFN48 package). I used the technique from this video. It it done with standard solder and a hot air gun. After soldering, I checked the joints with a microscope (just a cheap USB one). The rest of the part (mainly 0805 SMD) are easily solderable. The OLED screen is also SMD soldered. First, I removed the pin header from the module. Then, I filled up the holes with solder and using the soldering iron I soldered the module to the pads from the badge. According to the nRF52832's datasheet, the NFC and BLE antennas needs to be tunned. The NFC antenna needs to be tunned to 13.56 MHz. A couple of capacitors (in my design C9, C10 C16, C17) are used for this purpose. As I did not had access to a network analyzer, I tough to measure the inductance of the antenna. After a couple of tries of measuring the inductance with an Arduino based inductance meter (most of the multi-meters can't measure inductance), I gave up this idea. The inductance of the antenna is expected to be pretty small (in the 1-3uH range), which is not trivial to measure. Applying the two values to the datasheet formula gave me that the 133pF (2.0uH) -> 141pF (1.9uH) capacitance range should be used to tune the antenna to 13.56 MHz. A I had 2 pads for the capacitors (per pin), I ended up using 100pF + 33pF caps. In the schematics, I also added a capacitor (C15) for fine tuning, but this ended up not populated. The antenna works, but the signal strength could be better, I think. The board can be programmed in Arduino IDE, after installing some board packages and libraries. The BLE functionality is provided by the arduino-BLEPeripheral library, also from sandeepmistry. The library add support for implementing different kind of BLE service / devices. We will mainly use the BLESerial service from the "serial" example. I tested the NFC functionality both with an Android Phone (NFC Tools app) and an Arduino RFID reader. This application can be easily extended with additional functionality. The source code can be found in the attached repository. The nRF52832 SoC can be programmed using the Serial Wire Debug (SWD) protocol. A SWD programmer, like the $3 ST-Link V2 clone from Aliexpress, are needed to do this. 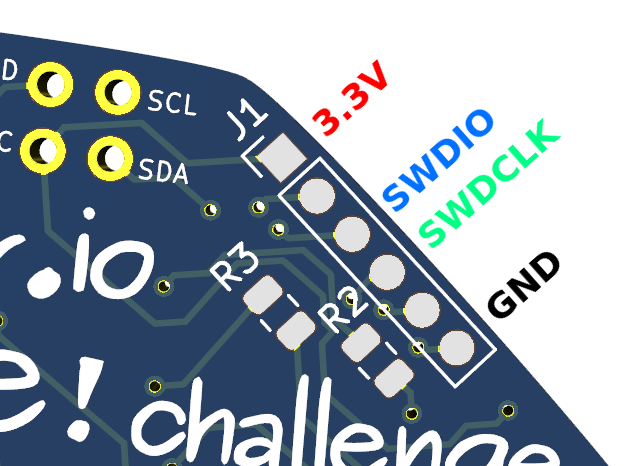 To program the board we need to connect GND, SWDCLK, SWDIO and VCC to the corresponding pins of the SWD programmer. A further, much better version could be also build from this style of programmer. It would be useful to have the possibility to program the badge wirelessly. I think, the first variant should be the way to go. It uses the somewhat standard OTA functionality of the Arduino IDE and having IPv6 implemented over BLE could be also useful for other projects too. Note: I have a couple of unused PCBs for the badge. Drop me a message if you want one.